Wondered what the secret ingredient was? It's roasted fenugreek, whole seeds dry roasted and then crushed with very coarse sea salt using a mortar and pestle. I had this big bag of teff and wanted to bake not only pancakes but also bread with it. I had a faint memory of seeing some Ethiopian breads in Maggie Glezers' Blessing of bread. So that was the recipe I turned to. Lesson learned: Listen to Maggie! 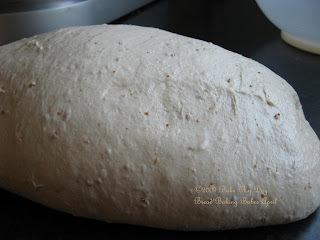 Mix and knead into a firm but supple dough, cover and let ferment overnight. (Depending on the sourdough you're using and the grade of grind from the teff flour you'll need to adjust the water content. My starter was rather liquid, the teff very fine, aim for firm and supple and consider adding a pinch of yeast for extra lift). Be forewarned! Switch on that exhaust fan and go on roasting that fenugreek, use a small pan over medium heat. The seeds will turn darker brown and go all fragrant.... (There's a warning in the book from the Ethiopian lady that gave the recipe to not touch the seeds with your hands before they are mixed with the salt or it will become bitter.) 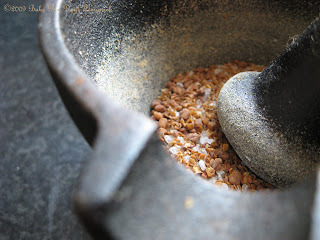 Mix and grind with the salt using a mortar and pestle or a spice grinder until coarsely crushed. Set aside. Mix and knead starter, flours, and water until a shaggy dough has formed, cover and let ferment (autolyse) for 30-45 minutes. Add salt/fenugreek mixture and knead into a full dough, the resulting dough will clean the bowl nicely and is quite soft to the touch, not sticky. Shape and proof: Divide in two, shape into two tight boules, cover and proof for another hour or until doubled/tripled; 1-1/2 hour. This is a very avid riser, didn't take long in my house. After shaping and proofing the dough has become very very soft! 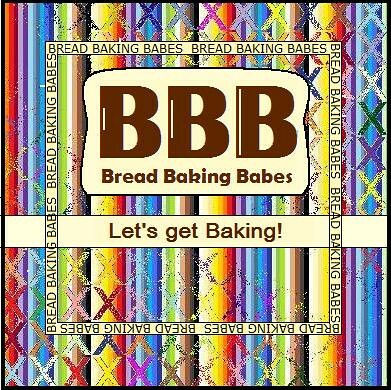 Bake, preferably on a heated baking stone, in a 450F/220C oven for 35-45 minutes. My family loved the bread, although it is quite specific in what you combine it with. I really couldn't taste it properly I'm afraid, I had spent so many hours in the fenugreek fumes that it was just too much at the time. The smell of the bread is wonderful though, the flavour there but not overwhelming. I was a wee bit disappointed with the baking, I'm afraid that the dough had overstepped it's boundaries in the rise and proof stage, not enough oomph left to give me ovenspring. Maybe the combination of a regular light -organic- whole wheat plus a regular bread flour with the no-gluten teff made it hard for this bread to keep it's stance. That's why I mentioned the high protein flour in the recipe. Another thing is that I baked one of the boules in a pan, the other in a romertopf.... I really think this one benefits from the all-around heat of a baking stone! (Or even a preheated cookie sheet). Still this bread performed. I liked the addition of the fenugreek, the interior was light and fluffy despite the much wanted not happening ovenspring. You can't have it all! Edit: I adapted the recipe to suit the -Dutch- flours I used and had on hand, the original is all white whole wheat and had no teff in the final dough, just in the starter. In the comments Jude asked about a little bitterness of the fenugreek lingering in the bread. 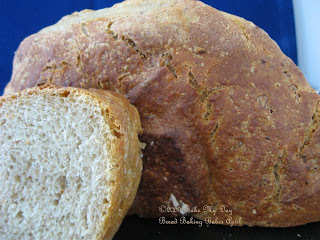 Maggie Glezer specifically mentions the use of white whole wheat for this bread instead of red whole wheat; the white is sweeter. I wonder if that is to complement the flavour of the fenugreek? Anyway I think with the differences in flours you might want to follow the original recipe in the book. No, you can't have it all. I don't have the lingering aroma of fenegreek in my kitchen and I'm not in my kitchen anywhay. But I'd be most happy to have this bread. Looks like it took a lovely tan too. What an interesting bread recipe! I have a huge jar of fenugreek and am always looking for ways to use it. I really should get this book. What a different recipe. This is a nice touch to add fenegreek. Beautiful bread. Now that is a bread I can't wait to try! Never seen a bread recipe with fenugreek seeds before so this sounds so intriguing. I bet it adds the slightest hint of bitterness. @Jude: Yes! That's what it was, I couldn't pinpoint it at first but there is an oh so slight hint of bitter in the bread and of course the lovely nutty flavour. @Mary: I will add an edit in the post because the original recipe is with all white whole wheat. Your American flours behave differently. Wow -- now I know how to use the remaining teff flour! Thanks Karen! Can't wait to try this. Great idea this bread, I love fenugreec. (did you have the cheese with it? Delicious!) I have the book, but did I ever make something out of it? I cant recall that. High time, and with this beautiful weather we'll just leave all the doors open to let the fumes out. I don't have fenugreek but I am intrigued by a spice that can inspire the word "aftermath" so I will have to get some! The bread looks lovely. Excellent! I've been wondering what to do with the rest of the Teff flour. This looks like a loaf my family would enjoy.